The whole point to being organized is to relieve stress by bringing your life back under control. Having a filing system in place for all of your paperwork will pay for itself several times over in stress relief when you don't have to frantically look for that one important paper you need. 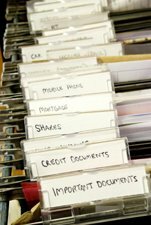 Believe it or not, a home filing system is at the heart of running an efficient household. I believe being able to find paperwork that you need 'right now' is more important than if your socks are folded nice-and-neat in your dresser. I know my socks aren't nice-and-neat, but I have an efficient and effective home filing system that allows me to find what I need at a moment's notice. I know that my health care bills along with health insurance explanation of benefits, home and car insurance docs, tax returns, bills, appliance warranties w/manuals along with the purchase receipts are all organized nice-and-neat. So, I'll walk you through how to develop an organized home filing system to tame household paperwork into a neat and orderly 'user-friendly' system which can mean the difference between a happy stress-free day or a stressful and time consuming day devoted to looking for an important paper that you need. Of course as with any organization project, once you have your home filing system up and running, you may have to adjust it to meet your needs. Only you will know what works for you once you get your filing system under way. Just remember, once you have an efficient home filing system in place, it is far easier to file a piece of paper away than it is to search for it endlessly when you're pressed for time. And, organizing your household paperwork doesn't have to be expensive. The amount of space you need for a home filing system all depends on how much paperwork you have to file. A simple box or an accordion file which can be purchased at most stationary stores can do the job if you don't have too much to file. My basic rule for organizing household paperwork is to keep non-vital documents in a simple filing cabinet like one of the ones listed above, labeled in hanging files with manila folders inserted into the hanging files. Personal and confidential vital records should be kept in a fireproof safe. It's important to keep vital records such as social security numbers, insurance policies (w/agent's name and phone numbers written clearly on the front of the policy so they're easy to find in an emergency), and birth certificates locked and secure in a fireproof box because if there's an emergency, you're going to need to reference these quickly and won't have the time to replace them. So, it's best to keep these in a portable fireproof safe to quickly grab and go if needed in case of an emergency. High Dollar Items Such as Car docs. If at all possible, keep the original window sticker along with all the maintenance records filed in chronological order as long as you own the car (this should get you more money when you sell it too since you've kept all the records). For other high dollar items that would cost more than your insurance deductible to replace, keep the original purchase receipt locked in a fire proof safe with your insurance policy and home inventory. Organize Warranties and Instruction Manuals. Get all of your warranty information and instruction manuals organized so you can find them fast when you need them. Bill Organizer. Learn how to effectively organize all of your household bills so they're paid on time all the time. Personal and Confidential Information Such as Vital Records. Wills, social security cards, insurance documents, car titles, birth/death/marriage certificates, divorce, and custody documents should be kept under lock and key. It's important to not leave this type of paperwork lying around, in case of a burglary or a nosy repairman. These important documents should be stored under lock and key in a fire proof case like one of these shown on the right. Income Tax Records. You'll learn how to organize your tax records so tax time is a fast and simple process. Get Help with Medical Bills. Excellent information on how to tame the health insurance paperwork nightmare to not only keep your health care costs organized, but make sure you're getting the most benefit from your health insurance. Mail Organizer. Get your mail organized fast as soon as it comes in the door, and learn how to get rid of junk mail for good. Estate Planning Checklist. Find out why this checklist is important to your family. Then find out how to get all of your important documents in order with ease with an estate planning checklist. Funeral Planning Checklist. Give your loved ones some peace of mind and learn how to develop a funeral planning checklist. Organizing Household Paperwork. Invaluable information to capture all of your other important papers and how to organize them. Written for either home office or household paperwork. Learn what you need to keep and for how long and what you can toss right now! Club Memberships. Health club, country club, whatever club you belong to that you paid money into... you need to keep the contract and payment info on file. Just keep a simple file that's labeled 'Club Memberships'. Stop Junk Mail. In order to get and keep paperwork organized, you need to first deal with paper clutter. An excellent way to keep clutter from entering the house is to stop junk mail from being delivered to your mail box. Use the tools in this article to learn how to easily erase junk mail from your life for good! It's also important to note that if you have an outstanding issue you're working on in one of the categories mentioned above, you should create a separate hanging file and label it something to the effect 'Tickler File' or 'Follow Up' and note your calendar as to when to follow up. Then when it's time to follow up, you'll simply grab the item from this folder to work on. For instance, I have a hanging file in the front of all my other hanging files labeled 'Follow Up'. I keep anything that I have an outstanding issue on and need to follow up on in this file. Right now, there's about ten pending items such as issues with my health insurance and medical claims, Flexible Spending Account claims, issues I'm working on with my daughter's school, warranty work for my dishwasher, paperwork I need to follow up on for another business my husband is starting, etc. And, I note my personal organizer as to when I'm going to follow up... usually every thirty days depending on the nature of the event. This 'Follow Up' file is one of the main ingredients to keep my home filing system running smoothly and I highly recommend you develop a simple one to keep your home filing system running smoothly. Finally, there's a few of things to keep in mind when developing your home filing system: 1) Don't get overwhelmed, do this in baby steps, 2) Use a system of organization that's going to work for you and you're going to use, and 3) Be consistent. If you always put the same type of document in the same place, you will never have to spend valuable time searching the house for it.